June Employment Increases, But Why? 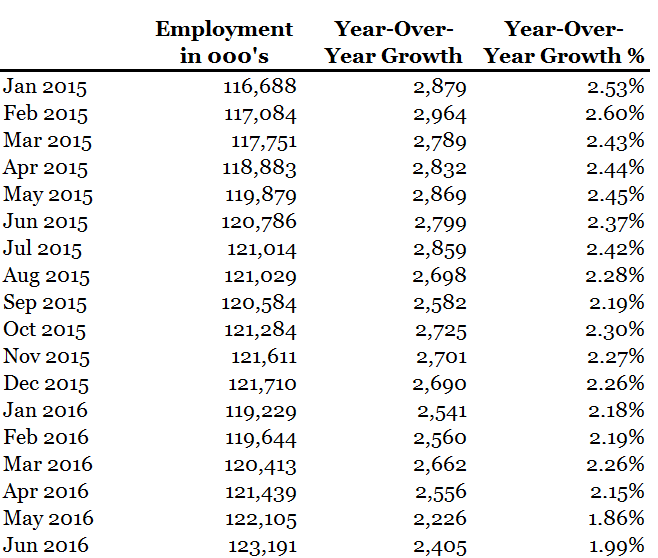 The US Bureau of Labor Statistics released its monthly June employment report earlier today. I have been tracking the BLS employment data for many years and have been writing about it here on this site for the past six months or so. In my prior article, I discussed how one indicator of the health of an economy is the employment growth rate of that economy. When demand for products and services increases, companies hire employees to meet that growing demand. When the reverse happens, companies slow down their hiring and may even lay off employees. 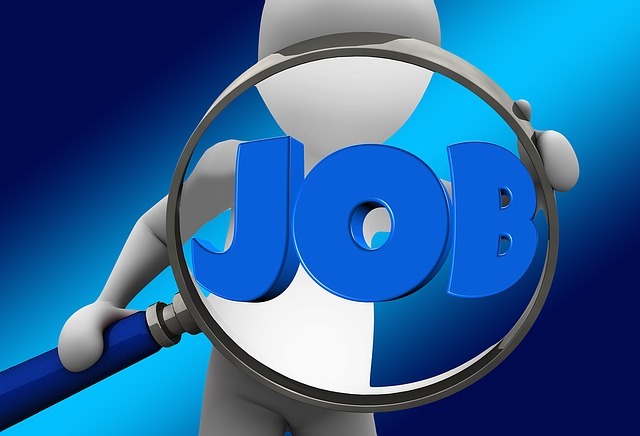 The June employment report was somewhat surprising both to me and to others based on the positive gains in the S&P 500, DOW, foreign markets, and even the US Bond market. For the month of June 2016, estimated non-seasonally adjusted total US private employment was 123.2 million, which is up 2.4 million, or 1.99% year-over-year from June 2015. Compare this to last month when we only added 2.2 million jobs, or 1.86%. By the way, the number reported for May in today’s report were slightly lower than the preliminary May numbers reported last month. But either way, May was the lowest employment growth rate we have seen since 2013. And then in today’s report, we see that June employment increased, reversing the declining trend we have seen in prior months. While it’s not all that unusual to see ups and downs month-to-month, with the volatility in the world markets driven by the Brexit vote, I was surprised that we didn’t at least see a slight decline. Also during the month, the Federal Reserve opted to keep interest rates flat again stating concerns about employment among other factors. Recall that we have seen a slow decline in employment growth since the peak in February 2015, when we added nearly 3 million jobs with a 2.6% growth rate. 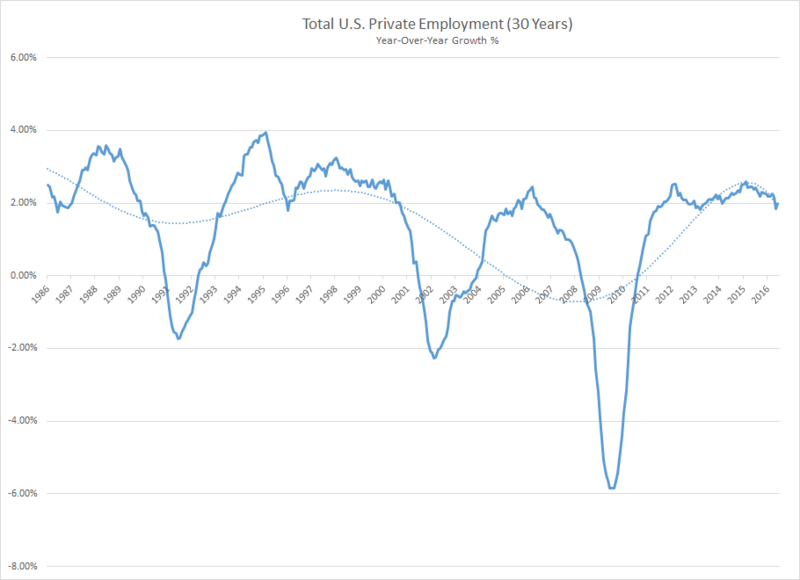 But even with the decline, for 71 straight months, the US has added private sector jobs year-over-year. As the 30 year chart shows, we cannot maintain a sustained high growth level indefinitely. There will be a correction at some point. The question is how much of a correction, when will it start, and how long will it last? The unexpected uptick in June employment growth this month is not enough to change my bearish view of the markets. I still believe employment is heading downward. And I have taken the following steps to solidify my capital base and prepare for a possible future economic slowdown. Despite my short-term market pessimism, I still believe in the long-term value of the market. As such, I am fully invested in my long-term tax-deferred accounts allocating 45% to US stocks, 20% to US bonds, 20% to real estate, 10% to international equities, and holding the remaining 5% in cash. It can be frustrating holding cash on days like today when we see a large positive gain in the markets. But as I mentioned in my June update, my shorter-term investments, or my FIRE accounts, are mostly in cash. And there are two reasons for this. These funds have a relatively short investment horizon, with very little time to recover from a significant market correction. And since my intention is to utilize these funds to bridge any gap between active and passive income, I want to ensure the funds are available if needed. Also, over the past year, I diversified my income streams from a single employer into multiple small businesses. And while I prefer having diversified income streams over a concentrated income stream, the businesses may require cash in the near future. Although less predictable, owning multiple small businesses is less risky than working for a single employer. Rather than generating all my income from healthcare, I now own multiple internet businesses, a consulting business, and a real estate business. And while initially I will generate similar income as before, self-employment also provides additional financial and lifestyle benefits. With interest rates at an all-time low, and while Ms. Financial Slacker has a corporate job, it makes sense to consider refinancing. I’m currently looking at an adjustable rate mortgage that will cut my payments and by continuing to pay my current payment, I’ll still pay off the mortgage early. Plus I’ll benefit from increased flexibility. Although I have stayed away from residential real estate due to the property management challenges, I am reconsidering. I may buy a rental property within the next few months thereby creating another diversified passive income stream. The June employment numbers surprised me and many others today. Last December, I expected a downturn in employment by mid-2016. So far, we have not seen it. I will keep my eyes open for indications that the downturn is further away than I anticipate. Readers, what are you seeing in the employment market? If you have a job, is your company hiring, laying off, or maintaining? If you are unemployed, are you getting call backs and interviews? I think we’ll see employment growth through September, and then start to see your anticipated declines. The market instability on a number of fronts has increased and the level of violent outbreaks has increased. These are often related.I think you are wise to keep enough cash to weather the upcoming storms. There was a period in the early to mid 90’s when the job market was tough. I was in college and worked in the business school. I remember the graduating MBAs were struggling to find work. It wasn’t until companies started worrying about Y2K and hiring IT contractors that the job market really took off. If we have something along those lines, we could see a strengthening, but for the most part, I think we’ll see a decline before we have another period of strong growth. And if we have a major geopolitical event that negatively impacts the US, we could see a sever decline. Good analysis and thanks for sharing your viewpoint. I don’t follow it nearly as close as you, but I certainly pay attention to it. So I was wondering your thoughts on the trend of “underemployment” and folks who have exited the labor force. Does this provide good slack for continued employment increases and productivity gains as the economy grows? Or do you see us falling into a recession soon instead? Thanks! That’s a good question. I’m not sure that I believe underemployment provides much slack. You’re either working or not. But I haven’t really looked at it that way. I do think long-term economic growth is driven by two factors – growth of the workforce and leverage provided by efficiency gains (primarily through technology). And over the past 20 or 30 years, we have had both factors in play. One big driver of workforce growth has been women in the workforce. Over the past 20 or 30 years, we have seen women who hadn’t worked previously enter the workforce. This was essentially an untapped pool of people that pushed the economy forward. I think we are starting to reach a stabilized level and won’t continue to see a mass inflow of new working women into the workforce like we have in the past. That means, we’ll be reliant on population growth and immigration to drive increases in the workforce. When you couple that trend with an overstressed and seemingly less effective educational system, we could be in for a rough time over the next decade or two. We have really moved into safe investments now that we have reached FI. We know what we need the money for and are not willing to gamble anything right now. Looking forward to hear if you choose to buy a rental property. We have 3 with 10 total units and manage them ourselves. It’s some work, but choosing the right property and tenants makes all the difference. We treat them like our clients and they have treated us well! Wanted to refinance but with no real “jobs” it is a challenge! The area where we live is over-built with multi-family housing and the population isn’t growing. That makes me a little cautious about buying rental property here. I have considered buying out-of-state, but that will require more coordination and obviously, we will be highly dependent on someone else to manage. More work to be done, but I’ll let you know. Good stats man, thanks for looking into it for us. I wonder how big the correct will be? Hopefully it won’t hurt too many. I would expect the magnitude and duration of the correction to be in line with prior corrections. Essentially, until there is a significant negative event, we seem to hover in the 1% to 3% growth range. Once an event occurs, we drop like a stone, and it takes a few years to get back to where we were. The good news is that after we drop, even before we have recovered, we get a really strong period of growth while we climb back up. This is the time to be buying into the market. I’ll be watching and letting everyone know my thoughts. Read an article on Medium today from a job website claiming listings are down dramatically this year compared to this month the previous two years. The most surprising thing to me if how few people report on the quality of the jobs created – that we’re having a “waiter & bartender” jobs recovery rather than a high salary career jobs recovery. Nothing against service workers, but those jobs are nothing compared to the manufacturing jobs that used to be the backbone of our workforce. I may revisit my analysis to take job quality into account. I spent many years in the workers’ compensation business. In that space, we mostly focused on more blue-collar jobs – construction, manufacturing, etc. – as those were the jobs where people got injured more often. Over the past 20 years, we have seen a dramatic decline in workplace injuries both due to improved safety but also to a shift away from those industries with high injury incident rates. If we are replacing those jobs with higher-paying office jobs than that’s not necessarily bad, but we will need to improve our educational system and training. But if we’re replacing those jobs with the waiter and bartender jobs you refer to, then we have a problem. Those personal service industries exist only because there are people working higher-pay jobs that can afford those services. Did not know that the Fed has opted to keep interest rates flat. I’ve been out of the news world recently. I believe that the job market is solid currently, my employer has hired in crazy amounts (though college employment stats are quite different from other employment stats), and I haven’t had a friend yet who’s unemployed. Thank you for the update. That’s good news to hear that your employer is hiring. I mostly hear from folks who are out of work. That may slant my view as they are probably more vocal and have more time on their hands. Out of curiosity, in what industry is your company? Australia also continues to have growing job numbers, though I suspect both of our country’s figures are boosted by part time and/or low pay positions. If we could see the average annual wage earned by these new people / the whole population we would see decline. The eomployment figures also tend to lag a bit behind consumer spendingz so if there is a consumer drop, the jobs will drop soon after that. Thanks for the comment, Tristan. In the past, I have done some comparisons of employment growth with market activity and with job pay. I’ll revisit as that’s a key component.